MetaStock is a software program that is designed to help you make better decisions about when to buy and sell in the stock, FOREX, futures, and commodities markets. MetaStock Real Time is our real-time product that is powered by Refinitiv Xenith - without it, your MetaStock Real Time product will not have data. MetaStock is our end of day product that is powered by Refinitiv DataLink data - without it, your MetaStock End of Day product will not have data. Real-time traders use intra-day data (prices that are constantly updating throughout the day) to make decisions about when to buy and sell during the trading day, this also allows you to look at different time frames (examples, 1 Min, 8 Min, 30 Min etc.). End-of-day traders access their data (Date, Open, High, Low, Close, Volume, and Open Interest) for the day after the markets have closed. We have products designed specifically for each type of trader. Refinitiv Xenith is a software and data module that empowers you with advanced, fully customizable analytical capabilities, and comprehensive cross asset data. It gives you a full breadth of global, economic, and critical market news to help you quickly identify the best ways to use and manipulate information. If I'm a professional trader, can I use Refinitiv Xenith? No, Refinitiv Xenith is only for Non Professionals as defined by the New York Stock Exchange: Nonprofessional Subscriber means any person who is not: (i) registered or qualified with the Securities and Exchange Commission, the Commodities Futures Trading Commission, any state securities agency, any securities exchange or association, or any commodities or futures contract market or association; (ii) engaged as an investment advisor; nor (iii) employed by a bank or other organization exempt from registration under Federal and/or state securities laws to perform functions that would require him or her to be so registered or qualified if he or she were to perform such functions for an organization not so exempt. Refinitiv DataLink is an end-of-day data service that provides the following data fields for a symbol: Date, Open, High, Low, Close, Volume, and Open Interest. The historical data goes back at least 15 years, often times with more. There are many different software programs that are compatible with Refinitiv DataLink using the Downloader program. What is the difference between MetaStock Real Time and MetaStock? MetaStock Real Time - Our premium technical analysis and charting software product for real-time traders. MetaStock - Our award winning analysis program that is designed to help you make decisions about when to buy and sell in the stock, FOREX, futures, and commodities markets based on end-of-day data. What is the difference between the subscription version of MetaStock and the purchase version of MetaStock? MetaStock can either be subscribed to on an ongoing basis or purchased outright. The subscription includes the MetaStock software and accompanying data feed and can be paid for on a monthly or yearly basis. If the subscription is cancelled, neither the software nor the data feed are accessible. The purchase version contains the MetaStock software only and is purchased for a one-time charge. The software is always accessible because you own it and have paid for it outright but would not allow you to plot any data without an active data subscription. With this option, you will have to sign up for a data feed separately to run data into the program. Our sales department can help you decide which option is best for you. What data feed do you need for MetaStock Real Time? MetaStock Real Time works with Refinitiv Xenith. The Refinitiv Xenith data feed gives MetaStock Real Time the highest quality analysis at the best price. What data feed do you need for MetaStock? MetaStock works with Refinitiv DataLink. The Refinitiv DataLink data feed gives MetaStock the highest quality analysis at the best price. Do I have to use MetaStock's data feed? Yes. 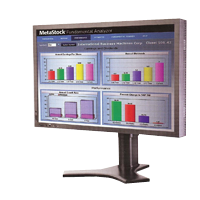 MetaStock Real Timeducts work exclusively with either Refinitiv Xenith (PRO) or Refinitiv DataLink (EOD) data feeds. What time frames can be displayed inside MetaStock? Other than tick by tick bars, real-time versions of MetaStock can display any intraday time frame in the range of 1 minute to 1439 minutes. For our end-of-day customers, any combination of daily, weekly, monthly, quarterly, or yearly bars can be displayed. Is MetaStock compatible with Microsoft's new Vista operating system? MetaStock 10.0 and earlier versions are not Vista compatible. Running MetaStock 10.0 or earlier versions on Vista is not recommended, nor will it be supported by MetaStock. MetaStock 10.1, released March 2007 is Vista compatible. Do I need to order an add-on or does MetaStock work on its own? MetaStock needs Refinitiv DataLink in order to run. MetaStock Real Time requires Refinitiv Xenith for its data. MetaStock and MetaStock Real Time do not need add-ons to operate. Add-Ons enhance the functionality of MetaStock. Which Add-On would work best for me? Which versions of MetaStock do the MetaStock Add-Ons work on? Most Add-Ons work for both MetaStock Real Time and MetaStock versions of MetaStock. However, the table below shows what we recommend. Where can I see a demo of the different MetaStock Real Timeducts? Most product pages include a link to our online video presentations. Also, you can visit youtube.com/metastocksoftware to find a comprehensive library of product demonstrations. Officially MetaStock is not supported when installed onto a Mac computer. However, they have many clients using MetaStock on the new Macs with the Intel processor and they have reported that they've encountered minimal issues. While MetaStock hasn't tested MetaStock on Macs, their discussions with customers using it indicate that for the most stable Mac environment, the Windows operating system must be running through a Mac application called Boot Camp. Similar applications may not work properly (for example Parallels or Virtual Machine). MetaStock software installed on a Mac computer is eligible for the 30-Day Money Back Guarantee. All conditions and requirements apply to Mac users regardless of the timing or nature of potential Mac related issues. MetaStock will make every effort to provide support for running our software on a Mac and help customers troubleshoot issues they encounter; however as they have not officially tested MetaStock in this environment, they are unable to guarantee support beyond a reasonable effort. Can I download and install the software after I purchase it or do I need to have it shipped? Once you complete your purchase, the downloadable file(s) will be located under My Account | My Downloads. In addition to downloading these products, you can also choose to have a package shipped to you that includes the software CD and manual. The manual is also available as a PDF in the software installation. For products that are not downloadable, a package must be shipped. What line studies does MetaStock include? What indicators does MetaStock include?